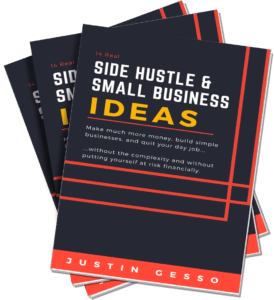 Ahead of the launch of my upcoming book, “The Book on Small Business Ideas,” I want to share the foreword, which is a fantastic case study on side hustle success. This foreword was written by my book’s editor, Greg Helmerick. Despite having an English degree, professional-level skills, and a big interest in grammar, he never did anything substantial with this skill and passion…because of his regular job. Sounds like a situation right up my alley. He ended up being a perfect case study. Greg’s first book editing gig was my book Leave the Grind Behind. After doing my book as a side gig, he began seeing how the pieces could come together. He took the principles from my book and within a year of editing Leave the Grind Behind, he used some of the principles from it and landed 8 other book editing jobs (all paid a flat fee). He also landed an ongoing editing gig with a major blog. All told, he earned solid 5-figures on the side doing something he truly enjoyed and gained fulfillment from. I was born with a grammatical spoon in my mouth. For as long as I can remember, reading, writing, and grammar came easy to me. So it only made sense that I should pursue a degree in English Writing. I did so while working a full-time job, but once I had my degree, I didn’t know what to do with it. I always enjoyed my natural talent for grammar, but I just didn’t have the techniques and fundamentals in place that would help me build a career out of that talent. Then, Justin called me. 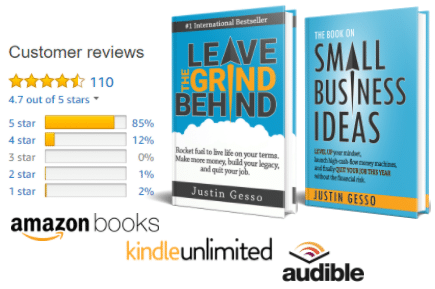 Justin and I have been friends for over 10 years, and after abruptly deciding to leave the corporate world forever, he wrote Leave the Grind Behind. He needed an editor, and it just so happened he knew someone with the right skills! After a brief discussion about the terms and book’s focus, I agreed and started grinding. Two things happened during the process. First, I realized (again) how much I love working with grammar. I love cleaning it up, improving clarity, enhancing readability, and striving to perfect it. Second, I learned valuable techniques and habits. Justin’s methods were actionable, straightforward, and sensible, and I started seeing ways to apply game-changing practices in my own life. In a word, Justin gave me the belief that I could turn one of my most valuable skills into a lucrative, scalable side hustle. The opportunity to edit Leave the Grind Behind was just the start. In no time, I had become the published editor of a successful, highly rated international bestseller. I was finally “out there,” and that visibility started leading to additional opportunities. Justin—and his networking techniques—helped me grow my name and business. And since Leave the Grind Behind was published just over a year ago, I’ve done professional editing as a side hustle for eight books (including this one) and have an ongoing editing contract with a major blog, all of which has resulted in five-figure earnings this year alone. You’re now holding or viewing Justin’s next big project, and I couldn’t be more proud of it…or him. Building on the practices in Leave the Grind Behind, The Book on Small Business Ideas will inspire you and spark your journey. Most books in this space are written by someone who had a winning-lotto-ticket idea, but how many of us can really hope to realize the same success? Justin doesn’t teach you how to get rich quickly—he teaches you how to get rich correctly. His books provide sustainable and accessible methods for the rest of us. Indeed, success is a foundation with many pillars, and each pillar, from mindset to networking to health, must be solid. Justin helps you build solid pillars through actionable success principles. My editing career is just getting started, and I owe it all to Justin. None of this would have been possible had I not followed his principles, implemented his networking techniques, and put his daily habits into place. I hope this book gives you that extra push you may need to follow your entrepreneurial dreams.